Xavier University Newswire Textbooks > Who Built America? > Sell Who Built America? The Xavier University Newswire students can sell Who Built America? (ISBN# 0312446918) written by American Social History Project, American, Christopher Clark, Nancy A. Hewitt, Nancy Hewitt, Roy Rosenzweig, American Social History Project Staff, Nelson Lichtenstein, Joshua Brown, David Jaffee and receive a $1.07 check, along with a free pre-paid shipping label. 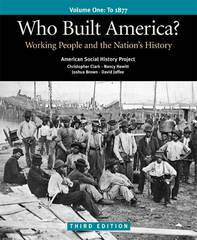 Once you have sent in Who Built America? (ISBN# 0312446918), your Xavier University Newswire textbook will be processed and your $1.07 check will be sent out to you within a matter days. You can also sell other The Xavier University Newswire textbooks, published by Bedford/St. Martin's and written by American Social History Project, American, Christopher Clark, Nancy A. Hewitt, Nancy Hewitt, Roy Rosenzweig, American Social History Project Staff, Nelson Lichtenstein, Joshua Brown, David Jaffee and receive checks.